*With summer officially only weeks away, we’ve got to start thinking of ways to keep our pets cool and safe. Each year, hundreds of dogs are left in hot cars with no ventilation, and the incident turns into a fatal one, with many dying from heatstroke. So when I saw this photo tweeted by @eRaKibn, I thought, what a great idea! Letting onlookers know that you have taken steps to ensure your dog’s safety may, for one thing, protect your property (many car windows are broken by well-wishers aiming to save your animal!). While some folks may just say people need to mind their own business, others will appreciate the heads up offered here. This particular tweet did manage to spark a bit of controversy though. The American Veterinary Medical Association (AVMA) says the interior in a car can get pretty hot, rather quickly, even if the temperature outside is cooler. According to them, when the outside temperature is a comfortable 75 degrees, a vehicle’s interior temperature — with windows closed one can assume — could escalate to a high 94 degrees in 10 minutes, and increase to a sweltering 118 degrees after an hour. So what’s a well-wisher to do? In some states, bystanders may want to think twice before taking a bat to that car window, because its against the law. But here in California, lawmakers are working to pass legislation (Bill AB 797) that will allow well-wishers to do whatever it takes when it comes to rescuing pets from hot vehicles; without fear of repercussions. According to the Bill, the rescuer would first call 911 and tell first responder’s that there is no other reasonable option to rescue the pet. 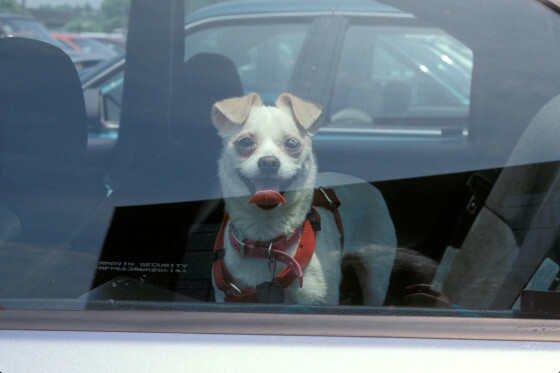 In Michigan, lawmakers are pushing for a law that would bring felony charges to anyone who leaves their pet in hot cars. Hmm…not a bad idea either. 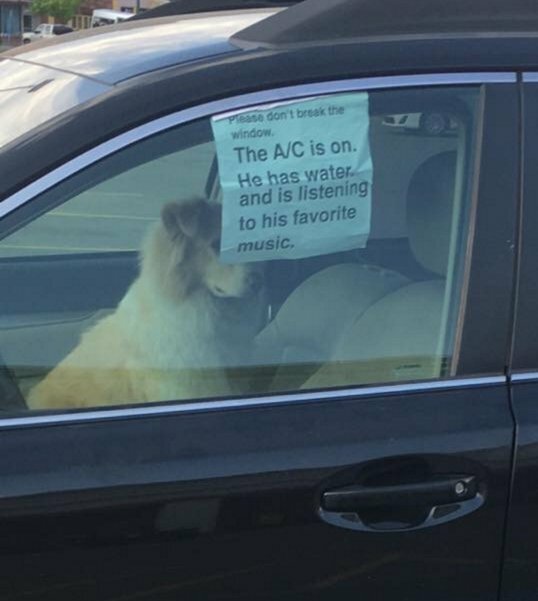 Do you think leaving a note in the window that tells potential bystanders that your pet is safe because you have taken precautions is something that should “catch on?” Or do you think people should just mind their own business because it is what it is. Weigh in with your comments below. And thanks.